Many readers of Essex Life are familiar with the nature reserve and gardens at Daws Hall, Lamarsh, near Bures. The Trustees are inviting people to come and view their large areas of snowdrops and winter flowers during their annual celebration taking place on February 10 and 17. Tickets are £6 for adults and children over five can visit for £1. Hot soup and a sausage roll will be provided at the end of your walk while any donations to support the work of the Daws Hall Trust will be entirely at your discretion. Marks Hall Gardens and Arboretum is set in more than 200 acres of picturesque landscape. Every year in February a carpet of three varieties of delicate white snowdrops emerges from the woodland floor in the Robins Grove area and Marks Hall is opened for Snowdrop Weekends. The moist, rich soils and semi-shaded woodland provides the perfect conditions for snowdrops to thrive and you can peruse the estate with a woodland walk or see the trees in the Millennium Walk area reflected in the nearby lake. There is plenty of other fascinating flora to admire in the Estate, from witch hazel to Himalayan birches down to the fragile snowdrops. One of the greatest manors in early 17th century England, Audley End House, the English Heritage estate, also has a beautiful landscape garden that is open year round for visitors. Although Audley End does not have a specific snowdrops day, the gardens are definitely worth a visit in the spring where you might catch sight of one. Make a day out of it by popping in to the Servants’ Hall Tea Room for cake and coffee. With a historical focus and stunning surroundings, you will feel like you’ve been transported back in time. Hedingham Castle is surely one of the grandest castles in Essex, even being used as a set for films and television, possibly because it has been unchanged for over 900 years. 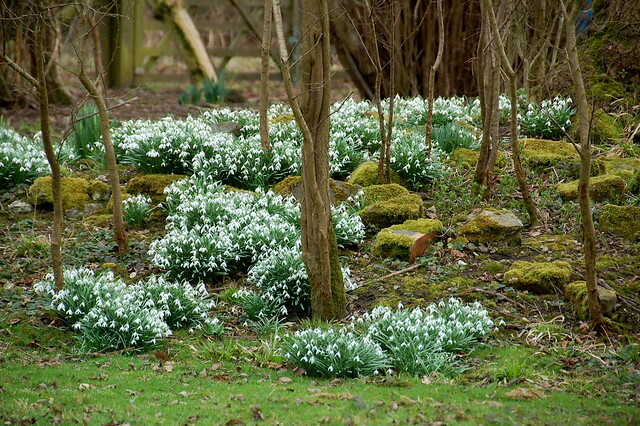 The breathtaking grounds of Hedingham Castle are specially opened for ‘Snowdrop Sundays’ on February 10, 17 and 24. There is plenty to see all year round but in February the grounds are covered with at least 13 types of snowdrops and with beautiful views of the Georgian Manor House and the café opening too, this is set to be a truly romantic day out. This Grade II listed garden boasts architectural intrigue, attractive art installations along, plenty of unique flora and a tranquil atmosphere – what more could you want from a day out early in the new year? Run and maintained by volunteers, this unique and stunning house and gardens is a wonderful spot to escape and to immerse yourself in the incredible natural surroundings. Although it is closed during winter, they open for three special ‘Snowdrop Sundays’ on February 10, 17 and 24. Easton Lodge in Great Dunmow has an intriguing history and dramatic renovations of the ‘forgotten gardens’ means that visiting the lodge is truly a treat. There is an atmospheric Italian garden that attracts lots of wildlife as well as a 1.9 acre walled garden. The volunteers at Easton Lodge are working hard to restore these historic gardens to their former glory yet the gorgeous renovated areas and rugged wildlife remain beautiful all year round. Along with the popular guided tours, the Lodge will host snowdrop open days on February 17 and 24. Adult entry is £4.50 while under-16s go free. The Green Island Gardens are a charming set of beautiful themed gardens including the Japanese garden, the water garden, and the seaside garden, each providing ample variety throughout the year. There is also a woodland garden which is carpeted with snowdrops in January and February and is the perfect place to welcome the New Year. Head over throughout January and February to see the snowdrops and drop into the tearoom for refreshments afterwards. There is a grand rock garden, a four-acre, 18th century walled garden, and a 450-foot long herbaceous border all on the grounds of Copped Hall in Epping. Just a few years ago this grand hall was merely a ruin but now guided tours are on offer to allow you to observe the ongoing restoration project and peruse the gardens. Book on to a tour to see the mid-18th century country house with its colourful history and have refreshments at the end of your visit. Check tour dates for February to see when is best for snowdrop viewing. When Beth Chatto started working on the gardens in 1960, the area was little more than an overgrown bramble patch with parched gravel and boggy ditches. After decades of tireless work, however, the gardens have been transformed into a utopia containing plants from all over the world. Throughout January and February snowdrops will be blooming in the gardens and there are two special courses that give you an insight into the history of snowdrops, how you can create your own swathes of the flower and how best to plant them. Tickets for the course are £15. As one of Britain’s finest remaining examples of Royal Hunting Forest, this National Trust woodland near Stansted Airport has been influenced by centuries of human intervention. As well as the patches of snowdrops you’ll encounter during January and February, you’ll have the opportunity to see many of the 3,500 species of wildlife that call the woodland home and ancient trees that are over 1000 years old.